The album kicks off with the title track ‘Gods of Vermin’ and is followed up by ‘A Blind Man’s Resolution’ both of which feature some genuinely powerful riffing in the vein of Iced Earth, but backed by great gusts of keyboards and the occasional ominous Gregorian style choir that catapult these tracks beyond the boundaries of genres. Sometimes we’re in power metal territory, but the next moment we find ourselves listening to prog style time signatures that might have been the work of bands like Circus Maximus or Cloudscape. A very impressive start to an album that rarely lets you down. I could go on to praise each individual track for its power, the riffing, the guitar harmonies, the dark keyboards that occasionally sound like something Dimmu Borgir could have come up with, Henning Basse’s impressive changes from clean metal singing to growling and the beautiful and operatic female singing (check out ‘Fallen Family’) that adds a goth dimension to the already multifaceted nature of this gem, but I’ll have to ask you to simply check this album out for yourselves. There’s something new to be discovered in the multiple layers of these 12 tracks every time you listen to them. 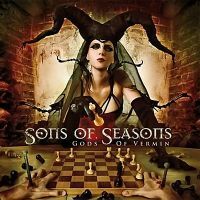 I have to admit that the voice of Simone Simons (Epica) is a bit too shrill to really appeal to me, and a few tracks (such as ‘Wintersmith’) may not be up to the phenomenally high standards of the remainder of the album, but none of this can prevent me from recommending Gods of Vermin to any fan of metal out there. This really is a great album – buy it!